Many years ago, probably even before I started this blog, I visited family in Hamden, a suburb of New Haven. I took the bus from Union Station. When it was time to go back to New York, I timed myself to get to the bus that would make my train, but it rained really hard and there was no shelter. The time passed and as the bus didn’t come, I sought refuge from the rain under a ceiling overhang at a store just behind the bus stop, in full view of the road. A few minutes later, the bus went through the station at full speed, not even slowing down to see if anyone wanted to get on, and to get to my train I had to hitchhike, getting a ride from people who saw that I was a carless New Yorker. Fast forward to 2018. My Brooklyn bus redesign plan with Eric Goldwyn calls for installing shelter everywhere, which I gather is a long-term plan for New York but one that the city outsourced to a private advertising firm, with little public oversight over how fast the process is to take. When I asked about the possibility of reducing costs by consolidating stops I was told there is no money for shelter, period. It was not a big priority for us in the plan so we didn’t have costs off-hand, but afterward I went to check and found just how cheap this is. Streetsblog lists some costs in peripheral American cities, finding a range of $6,000-12,000 per stop for shelter. Here‘s an example from Florida for $10,000 including a bench. In Providence I asked and was told “$10,000-20,000.” In Southern California a recent installation cost $33,000 apiece. I can’t find European costs for new installation, but in London replacing an existing shelter with a new one is £5,700, or $8,000. So let’s say the costs are even somewhat on the high American side, $15,000. What are the benefits? The gender breakdown comes from the fact that in unsafe neighborhoods, women perceive waits as even longer than the usual penalty, whereas in safe ones there is no difference between women and men. The upshot is that if the wait time is 10 minutes, then passengers at a stop with a bench and shelter perceive the wait as 15 minutes, and if there’s also real-time information then this shrinks to 11 minutes. If there are no amenities, then passengers perceive a 15-minute wait when they’ve waited just 6.5 minutes and an 11-minute wait when they’ve waited just 4. In other words, to estimate the impact of shelter we can look at the impact of reducing waits from 10 minutes to 6.5, and if there’s also real-time info then it’s like reducing waits to 4 minutes. If the wait is 5 minutes then the impact is similar. 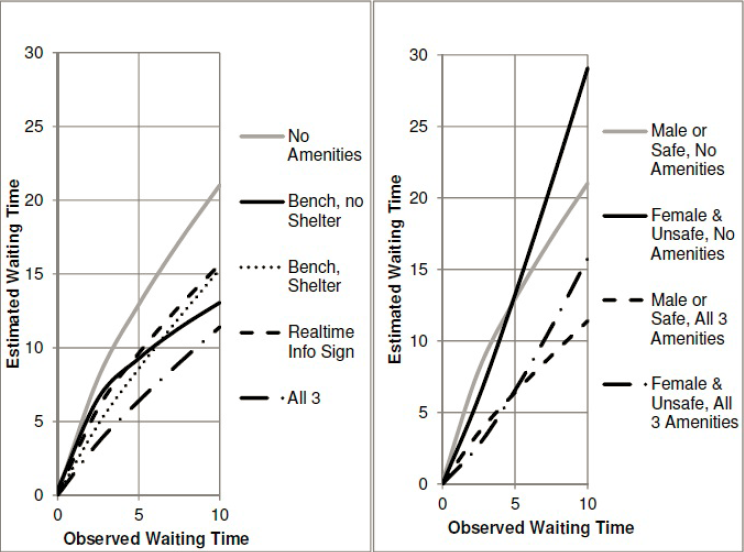 With bench and shelter the perceived wait is 8.5 minutes, equivalent to a 3-minute wait without any amenities; with real-time information, the perceived wait is 6.5 minutes, equivalent to a 2-minute wait without amenities. There is some scale-dependence, but not too much, so we can model the impact of shelter as equivalent to that of increasing frequency from every 10 minutes to every 6.5 minutes (without real-time displays) or every 4 minutes (with real-time displays). I have some lit review of ridership-frequency elasticity here. On frequent buses it is about 0.4, but this is based on the assumption that frequency is 7.5-12 minutes, not 4-6 minutes. At the low end this is perhaps just 0.3, the lowest found in the literature I’ve seen. To avoid too much extrapolation, let’s take the elasticity to be 0.3. Fan-Guthrie-Levinson suggests shelter alone is equivalent to a 50-66% increase in frequency, say 60%; thus, it should raise ridership by 15%. With real-time info, make this increase 30%. What I think of as the upper limit to acceptable cost of capital construction for rail is $40,000-50,000 per weekday rider; this is based on what makes activists in Paris groan and not on first principles. But we can try to derive an equivalent figure for buses. On the one hand, we should not accept such high costs for bus projects, since buses have higher operating expenses than rail. But this is not relevant to shelter, since it doesn’t increase bus expenses (which are mostly driver labor) and can fund its ongoing maintenance from ads. On the other hand, a $40,000/rider rail project costs somewhat more per new rider – there’s usually some cannibalization from buses and other trains. But taking $40,000/rider as a given, it follows that a bus stop should be provided with shelter if it has at least ($15,000/$40,000)/0.15 = 2.5 weekday boardings. If the shelter installation includes real-time info then the denominator grows to 0.3 and the result falls to 1.25 weekday boardings. In New York, there are 13,000 bus stops, so on average there are around 180 boardings per stop. Even in Rhode Island, where apparently the standard is that a bus stop gets shelter at 50 boardings (and thus there is very little shelter because apparently it’s more important to brand a downtown trunk as a frequent bus), there are 45,000 weekday riders and 3,000 stops, so at 15 riders per stop it should be fine too put up shelter everywhere. The only type of stop where I can see an exception to this rule is alighting-only stops. If a route is only used in a peak direction, for example toward city center or away from city center, then the outbound stops may be consistently less used to the point of not justifying shelter. But even that notion is suspicious, as American cities with low transit usage tend to have weak centers and a lot of job and retail sprawl. It’s likely that a large majority of bus stops in Rhode Island and all stops within Providence proper pass the 2.5 boardings rule, and it’s almost guaranteed that all pass the 1.25 boardings rule. And that’s even before consolidating stops, which should be done to improve bus speed either way. At least based on the estimates I’ve found, installing bus shelter everywhere is a low-hanging fruit in cities where this is not already done. In the situation of New York, this is equivalent to spending around $550 per new weekday rider on transit – maybe somewhat more if the busier stops already have shelter, but not too much more (and actually less if there’s stop consolidation, which there should be). Even in that of Providence, the spending is equivalent to about $6,600 per rider without stop consolidation, or maybe $3,000 with, which is much better than anything the state will be able to come up with through the usual channels of capital expansion. If it’s not done, the only reason for it is that transit agencies just don’t care. They think of buses as a mode of transportation of last resort, with a punishing user experience. Cities, states, and transit agencies can to a large extent decide what they have money for, and letting people sit and not get drenched is just not a high priority, hence the “we don’t have money” excuse. The bosses don’t use the buses they’re managing and think of shelter as a luxury they can’t afford, never mind what published transportation research on this question says. Bus shelters are clearly low hanging fruit and installing them at busy stops would certainly improve the image of transit. I know where I life it would be a priority if I was a town, village, or city public official. I would target the bus stops where I see people waiting everyday on my way to work, the ones in the center of town or near an apartment complex. Having fixed infrastructure opposed to a small signed nailed to a wooden utility pole makes public transit looks like a reliable solid form of transportation that is not going away, that is supported and invested in. By only concern is bus stops seem to attract graffiti and vandalism, especially the plexi-glass panels. I would want to chose a rugged design that would be easy to maintain, no plexi-glass, if there is graffiti or scratches you can just paint over it. I also think a big sign is good, like a circle with a “B” for bus or “T” for transit. I’d kind of want to see side enclosures, in case of wind + rain. But otherwise, yeah, it’s nice and minimalistic. With the design of the JCDecaux/CEMUSA shelters you still get wet. The rain or snow blows in the gaps in the top and around the narrower end wall. So while better than nothing, they are another transit item NY seems to get wrong. New Haven does have bus shelters at many of its stops, but they are of a lamentable quality: no bench seating at all, with glass panels facing the street, and generally no information for passengers about the bus route(s) serving the stop in question. They don’t even have advertising billboards, which seems like an obvious lost revenue opportunity. They might as well not be there at all. Compare that to Berlin bus/tram stops, which have ample seating, timetables, city maps with transport routes, and even (for busy stops) real-time information displays. So as the other posters noted, shelter quality matters a lot, as well as passenger information. The latter, in particular, is such an obvious low-hanging fruit for the passenger experience (actually knowing that your bus will stop at that stop at a given time) and so cheap to carry out that your supposition about transit agencies attitude to passengers in many North American cities can only be true. But framing bus shelter expenditure in terms of perceived journey time, and thus as an investment in increasing ridership, might be a good way to at least make headway on this issue. Buses are for poor people so the powers that be don’t care. Still this is a strong argument. When a new transit line is opened, some riders obtain a large increase in benefit while some obtain a marginal benefit. For bus shelters, pretty much every customer receives the same marginal benefit. This benefit also only compounds sub-linearly with future growth vs. how the strong future growth in value transit connectivity provides. Given this, my gut feeling is that you’ve overvalued stop infrastructure by around a factor of 4, and by applying a CBR filter, it becomes cost effective to provide shelters at around 20 boardings per day. The stop closest to my home is also one that receives more boardings than one would nominally need in order to consider a shelter, but which shouldn’t get one. I live around 1400 meters from a metro station, and 50 meters from a bus stop, with a posted schedule and real-time tracking available online, hosting an infrequent route to the station. If the bus isn’t coming within 5 minutes, I walk, even if I have to carry a toddler. Whenever I do wait for the bus, I never see someone at the stop more than 5 minutes before the bus arrival; everyone knows the schedule. In this case, there is very little added benefit for a shelter . Not every customer receives an equally marginal benefit, because different people have different disutilities for standing in the open waiting for a bus. The paper I’m relying on gives the example of women in unsafe areas. Another example is people with disabilities that make it hard for them to stand for long periods of time. What are the running revenues of bus shelter advertising versus the running costs of maintenance? Shelters provide SF MUNI with revenue. I’m sure it’s the same in many cities. The only place shelters don’t make sense is where sidewalk space is limited. of course, a bulb solves that, but that opens another can of worms..
I’m glad to see San Francisco knows how to prioritize. Why can’t the world’s richest city have a mildly competent government? Honestly, the new shelters are much better than the one’s they replaced, especially in regards to seating. The old round top shelters had these tiny metal flip seats that were absolute garbage to sit on. 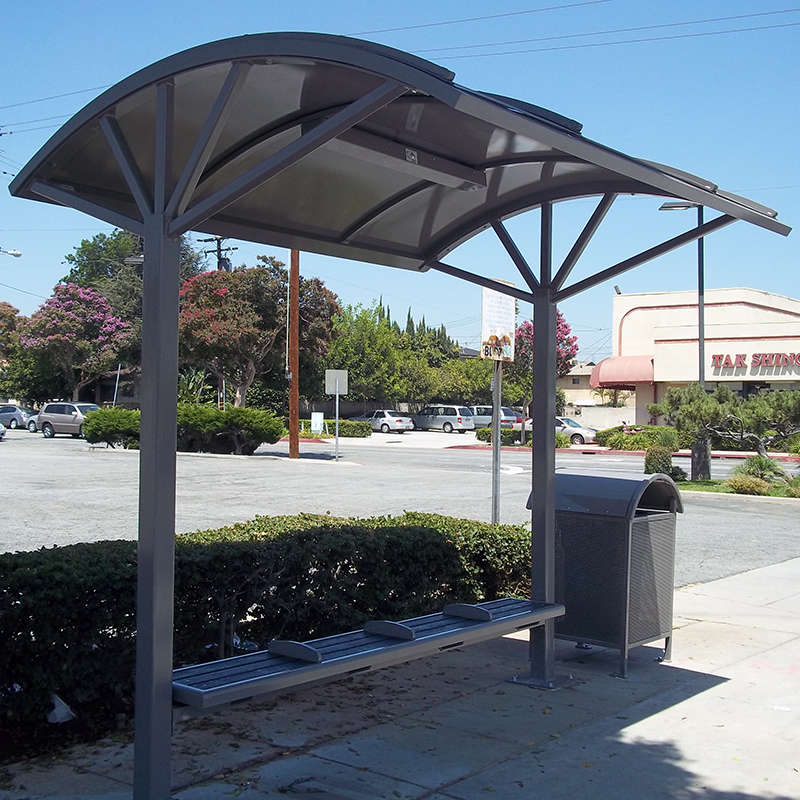 Unfortunately providing bus shelters is not always as simple as it should be, In communities where the transit service is provided by a separate entity, the sidewalks (where they exist) are controlled by the municipality, or county or state highway department, Revenue from ad sales goes to them and in some situations the shelter provider has to go through the permitting process, In any case, the interests of adjacent property owners come into play: not providing a camping site for the homeless, not blocking motorists’ views of business signs, responsibility for trash pick-up, snow clearance, repair of damages, etc. Due to the interaction of the ADA and typical 1950’s and 1960’s roadway widening that constricted the sidewalks it may be necessary to obtain an easement to encroach on the adjacent property in order to provide maneuvering room. In big regional systems, shelter and bench arrangements vary from place to place. The interest in improved public transit varies from one right-of-way manager to another, Their personal views influence approvals, In some cases that I worked on it took multiple meetings to even get the bus route on streets that turned out to be privately controlled, let alone a shelter. For the majority of my life I’ve been “transit dependent” and when the guys who smoke in the shelter at Broadway/11th slide over a bit to make room for this senior citizen I appreciate the shade and thank them. As a new dad in Boston, the lack of bus shelters anywhere remotely close to my house (JP) means I basically could not take the bus all winter without endangering the health of my babies. That and the fact that nobody shovels bus stops made the bus system basically unusable all winter. There’s a difference in design between shelters designed to shade sun and shelters designed for protection from rain and wind. In the Western US, shelters from Tolar are more popular; they aren’t all that great against rain or wind, but do provide shade. In the Eastern US, shelters from Brasco are more common; these usually have a more robust enclosure great for blocking rain and wind, but create an uncomfortable greenhouse effect in hot summers. US planners and transit nerds hate BRT and are always beating the LRT/streetcar drum. My theory is that it has to do with shelters. Bus shelters are so rare in the US people – even transit fans – associate buses with a complete lack of amenities. So when someone says “brt or LRT” I think part of the assumption people make is that the bus option means a sign on a stick, while the rail option means a shelter or station. There’s a flaw in that hypothesis: BRT is barely a thing in Europe where bus shelters are common. In fact “BRT” is only ever brought up to derail rail projects and usually seen as the cynical ploy it’s meant as. I think you should invert the measurement of effectiveness – riders per million dollars, rather than dollars per rider. It would give a more intuitive sense of what’s worth getting excited about and what not. Here in Carnforth, we (the Town Council) have budgeted £4,000 in this financial year to add a new bus shelter. Everything is more expensive in London, of course – but they can also get more for their adverts. I don’t know how much adverts make in the UK, since we don’t advertise on our shelters, but I found this whilst looking – https://bluelinemedia.com/bus-advertising/bus-stop-shelter. It looks like the advertising alone could pay for the bus shelters, particularly in somewhere like New York. FWIW, my local bus stop in Queens had a bus shelter. Once I had a car, the bus shelter was not the overwhelming factor in terms of my bus use. It was the ability to secure parking at the endpoint. The problem is that at 10 minute headways even in Queens, it’s easier to simply drive to the location and attempt to park than to take a slow bus that always seems to take the longest routing. So, given the tendency for US systems to call 15 minute headways “all-day frequent service”, I’m tempted to argue that agencies should place their efforts toward higher frequencies versus shelters if they want ridership increases. OTOH, I’m not a daily bus user, so I suspect that somebody waiting for the bus on the route that can’t support more than 15 minute headways would appreciate that shelter more than me.